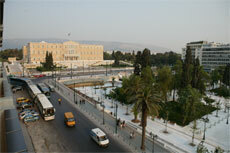 The Public Wireless Internet Access in Athens network (athenswifi) operates in the center of Athens, and specifically in the areas of Syntagma Square, Thission and Kotzia Square. Athenswifi in its pilot phase offers free wireless broadband access for all, helping people to familiarize with wireless technologies and the Internet. It officially began operation in June 2006, covering the widest range of Syntagma Square, and by early September 2007 it covered most of the region of Thissio (Saint Paul pathway, Assomaton, Thissio Metro station) and Kotzia square. After the first year of operation in Syntagma Square, there have already been made over 120,000 connections, with more than 30,000 users, carrying more than 5,5 TB of data. Citizens may connect free of charge to the Internet at any time of day and get familiar with wireless broadband access via laptop, while sitting on a bench or on a coffee shop in the region. Access is very simple, as you only have to connect to the wireless network (SSID) athenswifi and type the number that appears on the browser in your first attempt to access a Web page. The speed is very fast, as each region is connected to the Internet through a 4Mbps line (OTEnet). The network will remain operational until the end of 2008, as a part of people familiarization with wireless broadband. 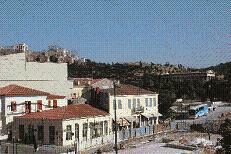 The existence of wireless hotspots, or, as in this case, wireless public areas with Internet connectivity is an important priority for the Special Secretariat for Digital Design (Information Society), which in this context has already organized a series of demonstration projects to promote wireless broadband throughout Greece. 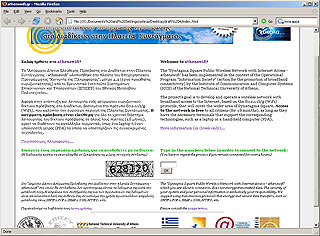 The project was funded by the Special Secretariat for Digital Design, through the Operational Program for Information Society, and it was implemented by the Institute of Communication and Computer Systems (ICCS) at the National Technical University of Athens (Computing Systems Laboratory-CSLAB). You can find more information on the credits page. At this site you can monitor the network traffic in real time, you can find technical information relative to the project, and you can get usage statistics or information about its development status. For more information, please contact us via e-mail. The project has been included in OP Information Society, financed by the E.E. and implemented by the Computing Systems Laboratory of ICCS - NTUA.